Lightweight, collapsible travel carts fold up and store easily in a car trunk and can be checked or carried on an airplane. Ideal for transporting luggage, tool kits, test equipment and other heavy objects. 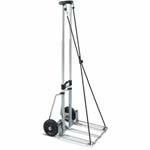 Sturdy, double-telescoping, self-locking frame allows you to open or close cart with one easy motion. Permanently attached stretch cords are adjustable to hold loads securely. Steel platform base. Step slider smoothly slides carts up or down steps. This model has solid rubber wheels. Collapsed Dimensions: 20.3" x 12.5"
48" x 15.8" x 12.5"